This art deco style necklace will make heads turn with its forward design. Round brilliant cut diamonds adorn this necklace from end to end in an eternity setting. These prong set diamonds glitter in circle links that alternate with shiny linear links totaling 4.59 carats. 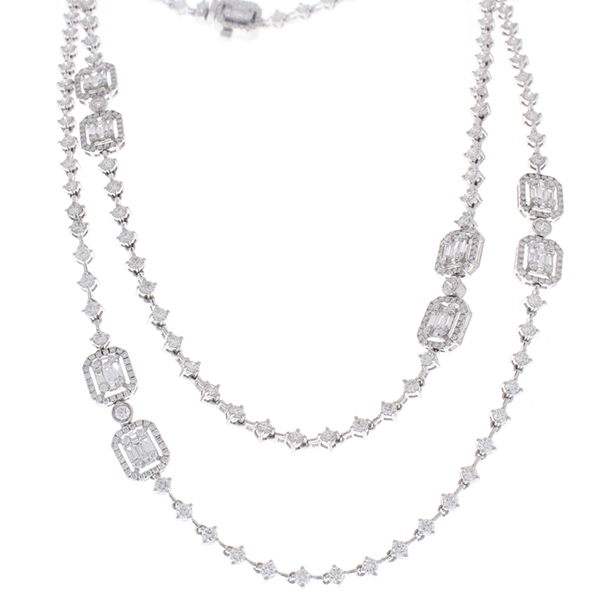 Intervals of shimmering baguette diamonds adorn the sides of the necklace in exquisite decorative detailing. Made in brightly polished 18 K white gold, this elegant necklace measures a lengthy 28 inches long which makes it ideally suited for layering with other necklaces and pendants of your selection if you desire. A hidden clasp closes the necklace securely. If you are looking for something more than a tennis necklace, this is it.